MAKE A GROUP AND GO ON AN ADVENTURE TOGETHER! HERE ARE SOME SUGGESTED PLACES TO VISIT. You should be able to get to these locations, enjoy some time, eat dinner, and get back in time for the evening activities. Excursion times are Saturday and Sunday afternoon. You may wish to make plans to do more excursion activities on Monday on your own, as it is a free/travel day. 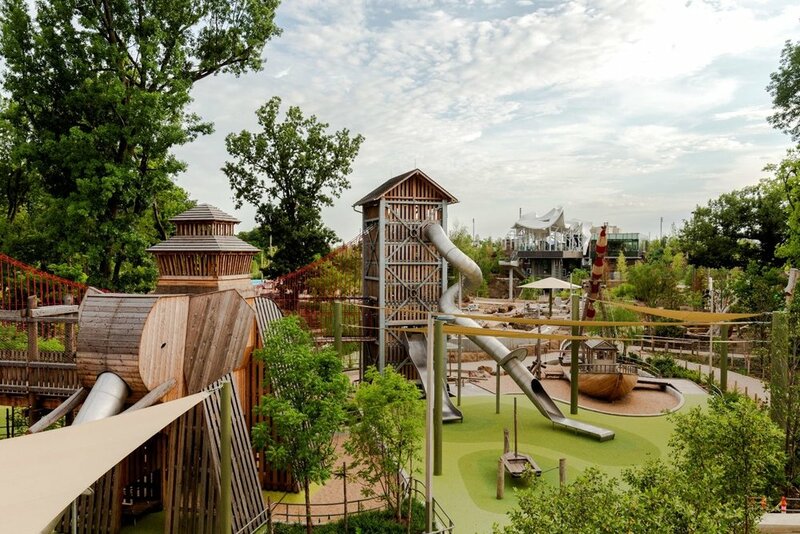 Tulsa’s Riverfront Park - Voted USA Today's Best New Attraction 2019. Nearly 100 acres of Tulsa’s iconic waterfront along the scenic Arkansas River transformed into a dynamic, interactive environment. Sport courts, skate park, small boat rentals, 5-acre playground, splash-pads, open spaces, trails, gardens, swings/slides, sand beach, and more. Mission: to preserve Oklahoma’s aerospace history and to inspire science-based learning through discovery. Out-of-this-world audio-visual experience in the planetarium with recent tech upgrades. The Tulsa Air and Space Museum & Planetarium (TASM) offers hands-on exhibits including one-of-a-kind aircraft, educational tours, and special events that encourage kids and adults to learn together. Inspiring passion for wildlife in every guest, every day.Wide variety of animals in immersive habitats that allow zoo guests to feel transported to native environments of the animals. Travel time: 24 min 15 miles // Parking: On weekends and holidays from April 1-Oct. 31, Mohawk Park $2 per car. Mission “To educate and inspire conservation of our aquatic world through interactive discovery” with animals from local Oklahoma to tropical and endangered. Ten main exhibits including Amazing Invertebrates, Extreme Fishes, Aquatic Oklahoma, Ozark Stream, Ecozone, Shark Adventure, Marvels and Mysteries, Sea Turtle Island, and Polynesian Reef. One of the country’s best facilities for the preservation and study of American art and history including extensive collections of rare books, documents, maps, and unpublished material related to the history of the North American continent. The world’s largest/most comprehensive collection of art and artifacts of the American West, including an unparalleled collection of Native American art and material. Situated on 460 acres including 23 acres of historic theme gardens and the 136-acre Stuart Park. Museum, lodge, and wildlife preserve. The ranch is a 3,700-acre wildlife preserve, home to 30+ species of native and exotic wildlife, such as buffalo, elk and longhorn cattle established in 1925. A museum with an outstanding collection of history, western art and artifacts, Native American material, fine art, one of the finest collections of Colt firearms in the world, and much more. Many trails for hiking, etc. The villa in which the museum is housed was completed in 1927 with72-rooms surrounded by 23 acres of grounds that contain elaborate gardens inspired by an Italian country estate. The museum's permanent collection encompasses European, American, Native American, Modern and Contemporary Art and Design, African, Asian and Antiquities. Satellite facility in Tulsa’s Brady Arts District opened in 2013 featuring Modern and contemporary art as well as highlights from their comprehensive Native American collection.